(a) A wholesaler who trades in maize grain only. (b) A wholesaler who supplies goods to most of the traders in Kitui, Mbooni and Machakos districts in the Eastern part of Kenya. (c) A wholesaler who buys tomatoes from farmers in rural areas and sells the same to other wholesalers in urban areas. (d) A wholesaler who trades in a wide variety of human medicine. 16 The following balances were extracted from the books of Nafula Traders as at 31st December 2005. 17 The information given below was extracted from the books of Amina Traders on 31st December 2006. 19 The table given below represents the supply schedule of sukuma wiki (kales) for eight weeks in the months of January and February 2009. 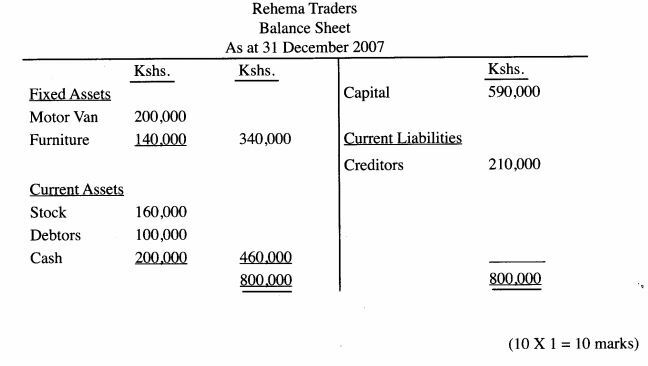 The following transactions took place during the year ended 31 st December, 2007 (i) Sold furniture worth Ksh. 60,000 for which Ksh. 40,000 cash was received and the balance was due at the end of the year. 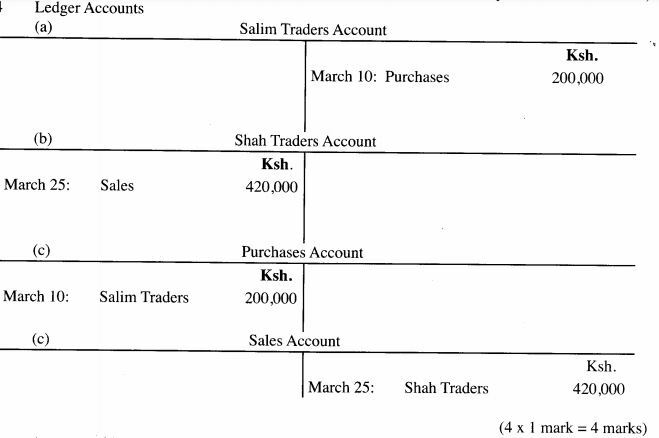 (ii) Purchased goods Worth Ksh.100,000 for which cash of Ksh. 70,000 was paid and the balance was still outstanding at the end of the year. (iii) Cash Ksh. 10,000 was taken from the business by the proprietor to settle the spouse's hospital bill. (e) a trader has a chance of increasing sales. Refers to a progressive increase in the general level of prices brought about by an expansion in demand. There is too much money chasing very few goods. A progressive increase in the general price level brought about by a general increase in the cost of production. Refers to an increase in domestic prices resulting from importation of primary goods and inputs at higher prices. Refers to a persistent rise in prices resulting from failure of the economy to meet the general increase in demand. (i) Low demand for goods and services which discourages production activities hence interfering with development. (iii) Negative sociocultural practices which may hinder production and consumption of certain goods and services. (iv) Inadequate foreign exchange which limits access to imports hence affecting production and consumption. (v) Limited entrepreneurial abilities resulting into inefﬁciency in production. (vi) Poor management of resources arising from inadequate skills, corruption and poor govemance which limit the extent of growth and development. (vii) Poor nutrition and disease prevalence which renders some of the people unproductive as well as channelling much of the income into provision of health care instead of investment. (viii) Use of inappropriate technology which compromises the quantity and quality of goods and services produced. (i) Where bulky goods are imported. Bulky goods are usually transported by sea where containers are used. (ii) Where specialized equipment are available for handling containers. (iii) Where container terminals are available - containerization require container terminals which are specially built to handle them. (iv) Where specialized means of transport like railways are available. (v) Where security of goods need to be guaranteed. Goods of very high value and those that are risky require high level of security which is guaranteed by containers. (vi) Where skilled personnel are available. The handling of containers require specially trained workers to handle and manage them. (i) Notifying the insurer of the loss suffered. (ii) Filling a claim form from the insurer. (iii) Carrying out investigation to determine or ascertain the cause of loss. (iv) Insurance company making a report. (v) Determination and payment of the claim. (i) Cost of the method. The organization should choose a promotion method that is affordable. (ii) Geographical area of coverage. The organization should choose a method that will reach the customers in their various locations. (iii) Target group. The organization must choose a method that appeals to the relevant target group. (iv) Speed of the medium or method in relation to urgency of the message. The organization should choose a method that will reach the customers within the desired time frame. (v) Nature of the product. Different methods may be chosen depending on the nature of the product e.g. technical products may require demonstrations best achieved through personal selling. (vi) Nature of the message. The organization should choose a method that will best present the various aspects of the message. (i) Scarcity. They are found in small quantities compared to the many uses into which they have to be put and hence not sufﬁcient to satisfy all human wants. (ii) Monetary Value. They have a price attached to them which have to be paid for their use. (iii) Uneven distribution. They are not distributed uniformly in society, hence some people, regions or countries have more of the resources than others. (iv) Combinability. They can be used in different proportions to produce goods and services. (v) Usefulness. They are used to satisfy human wants (have utility). (vi) Transferability. They may be transferred from one person to another in terms of ownership. (i)Easy supervision. It is easy to monitor employee’s perfonnance since they are in the same room. (ii) Economy of space. More ﬂoor space is available since space has not been lost through partitions. (iii) Minimal cost. It is cheap to construct and maintain. (iv) Sharing of resources. It makes possible for joint use of ofﬁce facilities. (v) Easy communication. Communication between workers and departments is made easier and faster since there are no physical barriers between them. (v) Easy reorganization. It is easy to re-arrange the ofﬁce when need arises. (vi) Enhanced teamwork. Employees work as a team and learn to be together. (i)Expiry of time or accomplishment of purpose. Where the partnership was formed for a deﬁnite time or a particular purpose, the expiry of time and accomplishment of purpose terminates the partnership. (ii) Mutual agreement among partners - where the partners agree among themselves to terminate the partnership. (iii) Bankruptcy of a general partner - where a court declares the value of one of the general partner’s property insufﬁcient to settle his or her debts. (iv) Change in law that makes the operations of the partnership illegal. (v) Permanent inability of a general partner to perform or fulfill his part of the partnership agreement either as a result of disease, insanity or death. (vi) Internal dissension among partners - where partners disagree irreconcilably, then the partnership may be terminated. (vii) Persistent losses in operation - where the business has continued to operate at a loss, then it is terminated. (v) Fraud, mistake or misrepresentation - where the partnership was formed under fraud, mistake or misrepresentation, a Court of Law may order its dissolution. (i) Nature of the ﬂowers - ﬂowers are perishable and therefore need a short channel in order to be distributed quickly. (ii) Cost. The cost of different channels of distribution should be considered and the cheapest channel used. (iii) Nature of the market. If consumers are widespread, then agents may be necessary to reach them. (iv) Tastes and preferences of consumers. Consumers may have speciﬁc preferences which might require the personal attention of the producer hence use of a shorter channel. (v) Competition. Where competition is high, the producer will have to close to the consumers and will therefore use a short channel of distribution. (vi) Quantity. If the quantity of ﬂowers to be sold is large. then more middlemen may be required. (vii) Availability of technical personnel. If the producer does not have the required technical personnel, then he may have to use a longer channel. (i) To reduce details to be recorded in the ledger accounts. (ii) Act as back-up data from which other information may be extracted if need arise. (iii) Contain information which act as reference such as units, trade discounts and terms of sale. (iv) The general journal is used to correct errors made when recording transactions. 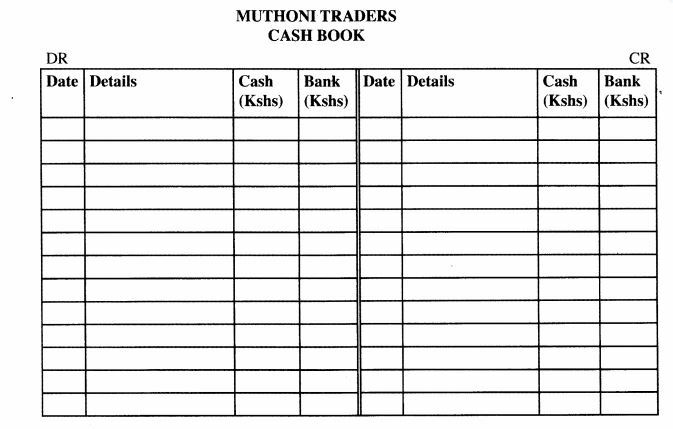 (v) The three-column cash book is used as a book of original entry as well as a i ledger. (i) Reliance on primary products for export. Most developing countries mainly export primary agricultural products which fetch low prices in the international market. (ii) Heavy importation of ﬁnished goods. Most developing countries import ﬁnished manufactured goods whose value are very high hence spend more on them. (iii) Low levels of technology. Most developing countries rely on low levels of technology in production which compromises the quality of their exports and also lowering their value. (iv) Too much reliance on foreign borrowing. Most developing countries ﬁnance their development projects through heavy borrowing yet such loans are repaid with heavy interests. (v) Susceptibility to natural calamities. Many developing countries are easily affected by natural disasters like drought which adversely affect their production. (vi) Preference towards foreign goods. Most consumers in developing countries prefer goods manufactured in foreign countries in the belief that they are of better quality. (vii) Unfavourable world economic order. The developing countries have very little say in international trade forums and cannot inﬂuence the world economic order in their favour.